This bird was sitting on a telephone cable. The coloration doesn't seem to match any of the hawk like birds in the WhatBird database. Photo was taken today (Oct 18,2018) in late afternoon in Plano, TX. 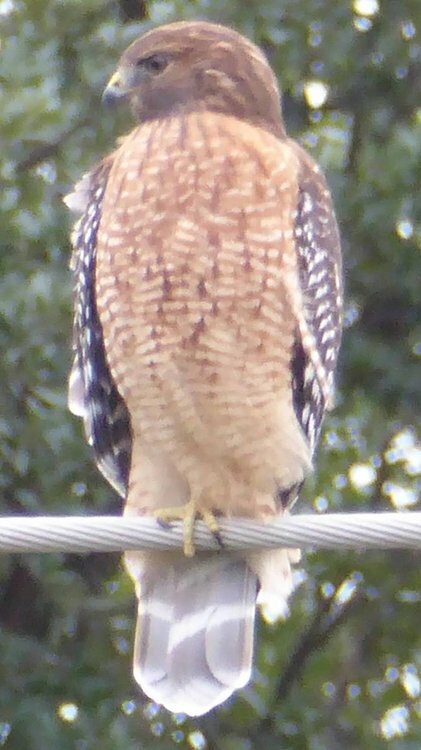 This is indeed a Red-shouldered Hawk. The orange color below along with the black and white pattern on the wings eliminates Red-tailed. The tail pattern also eliminates Red-tailed. Definitely Red-Shouldered. See them basically everyday except in FL. They don't have as much orange as this one, ours tend to be more gray, but unmistakable. There is a pretty large size difference between Red-tailed and Red-shouldered in bird terms as well. Where are you from Bigdaddy44. Yes, Florida birds are more gray because they're a different subspecies. Florida's endemic subspecies is (extimus), vs Lineatus Group, the Eastern subspecies group that has brighter adults like this. I live in Wesley Chapel, FL.